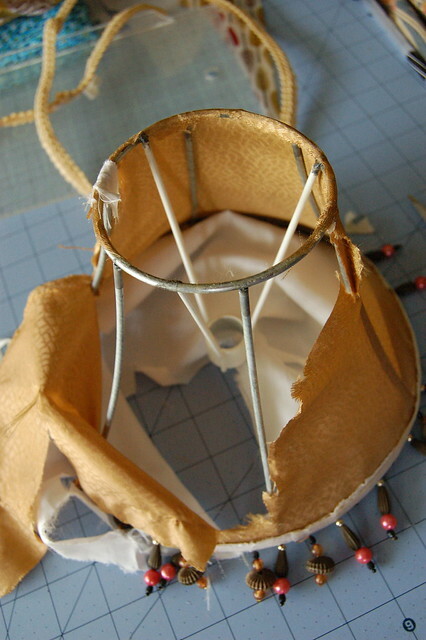 Ripping apart ugly lampshades is good for the soul. Try it, you’ll see! 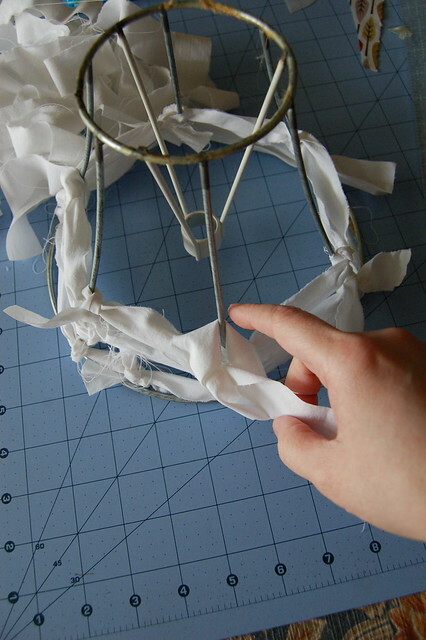 Then take scrappy little strips of fabrics and tie them around the bare metal framework. 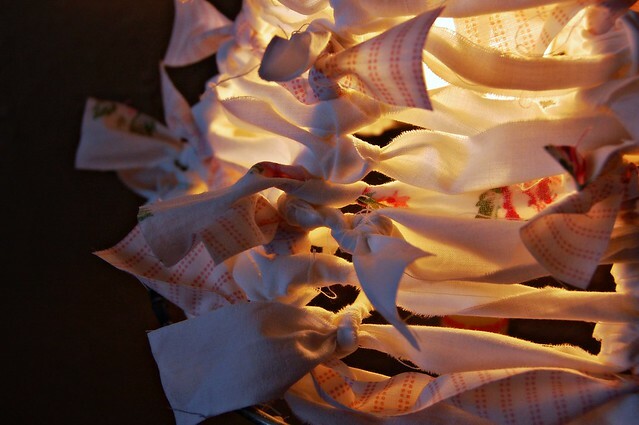 I used vintage sheets and ripped strips about an inch wide. Ripping rather than cutting gives the ragged, stringy look I was going for. I tied the strips over each spine and tried to leave the ends on the outside of the shade, so they’d be away from the heat of the bulb. I trimmed up any long strings inside the shade too, just in case. Keep going until you’ve covered the shade. More or less, it’s up to you. The question is, do I like it? Hmmm. 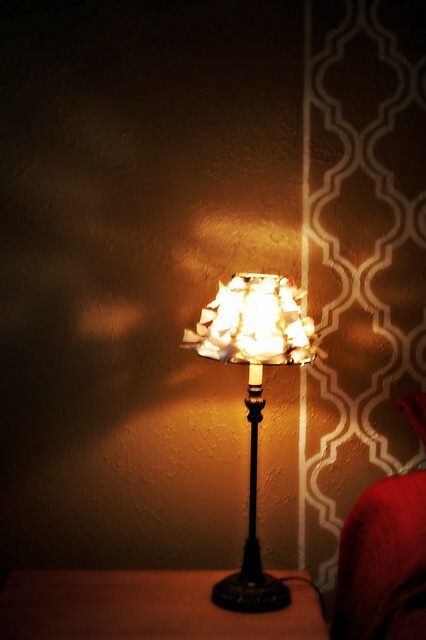 I think what I really need is a more substantial table lamp. But for a free makeover? Oh yeah, it’ll do! love it! so cute! i was hoping someone would do it in another colorway so i could see what it would look like. thanks for sharing! 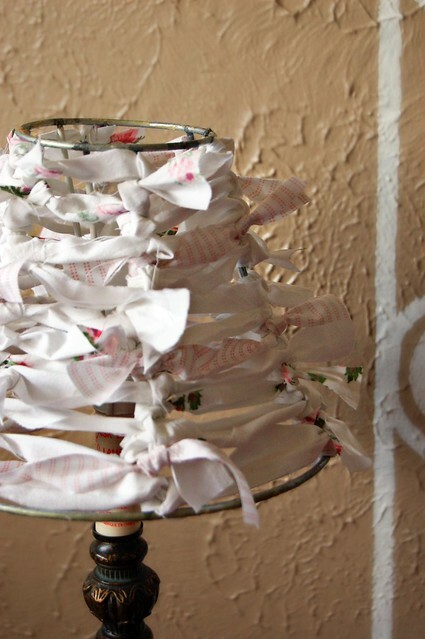 Lindsey, I LOVED the lamp you made for your girls! The light patterns on the walls and ceiling were almost as beautiful as all the happy colors. Thank you! !